Pesky gNATs is available to appropriately qualified mental health professionals. Register here to request access to Pesky gNATs. The Pesky gNATs computer game helps to support the delivery of a child friendly CBT intervention. It is designed for use in sessions where a young person plays the game along-side a mental health professional. 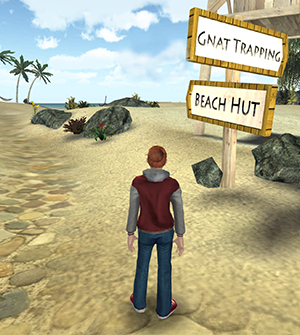 In the game young people visit a 3-D world called “gNAT’s Island” and meet a team of wild-life explorers. Each member of this team introduces a single CBT concept. These concepts are illustrated through conversation, embedded animations, videos and questions, using examples from a young person called Shona who has also experienced difficulties with anxiety and low mood and played the game before. The game has seven levels. Each level is designed to be the equivalent of a standard treatment session and supports a single component of a customised, developmentally appropriate CBT intervention. 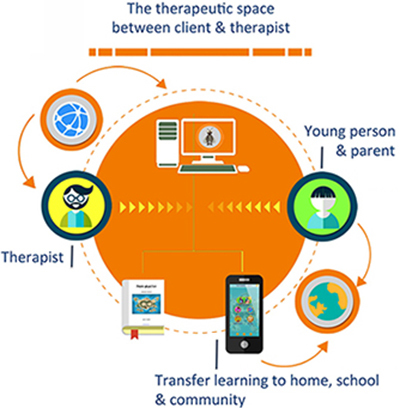 With the help of their therapist the young person applies the CBT concept they learn in each level to their current difficulties. Each level also has the option to learn a mindfulness or relaxation skill. In the game an unfolding concrete metaphor is used to make CBT concepts accessible to children. ‘Negative Automatic Thoughts’ are presented as little creatures called ‘gNATs’ that can sting people. ‘Cognitive monitoring’ becomes gNAT trapping, ‘cognitive restructuring’ becomes gNAT swatting, ‘Core Beliefs’ are discovered through hunting gNATs back to their Hives. Relapse prevention takes place at a future-world cinema. The Pesky gNATs mobile app is available for iPhone and Android phones and tablets. It is free to download for any young person playing the computer game with a therapist. The App is designed to help the young person to apply the CBT ideas they learn in session, with their therapist, to their everyday life at home, at school and in their community. It includes weekly CBT tasks, mindfulness and relaxation skills, a gNAT gallery, and three gNAT related mini-games that are unlocked when the young person completes their between session tasks! While it is free to install, the Pesky gNATs App requires an access code that can only be provided by a registered Pesky gNATs therapist. This access code allows young people to unlock the app when they open it for the first time. After that the young person creates a personal access code, which only they know and which is used to secure the app and their own content.